If the day seems a little longer than usual on Saturday, June 30, 2012, that’s because it will be. An extra second, or “leap” second, will be added at midnight to account for the fact that it is taking Earth longer and longer to complete one full turn — a day — or, technically, a solar day. “The solar day is gradually getting longer because Earth’s rotation is slowing down ever so slightly,” says Daniel MacMillan of NASA’s Goddard Space Flight Center in Greenbelt, Md. Scientists know exactly how long it takes Earth to rotate because they have been making that measurement for decades using an extremely precise technique called Very Long Baseline Interferometry (VLBI). VLBI measurements are made daily by an international network of stations that team up to conduct observations at the same time and correlate the results. NASA Goddard provides essential coordination of these measurements, as well as processing and archiving the data collected. And NASA is helping to lead the development of the next generation of VLBI system through the agency’s Space Geodesy Project, led by Goddard. 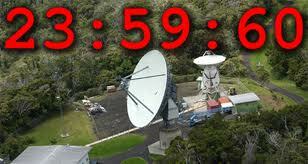 From VLBI, scientists have learned that Earth is not the most reliable timekeeper. The planet’s rotation is slowing down overall because of tidal forces between Earth and the moon. Roughly every 100 years, the day gets about 1.4 milliseconds, or 1.4 thousandths of a second, longer. Granted, that’s about 100 or 200 times faster than the blink of an eye. But if you add up that small discrepancy every day for years and years, it can make a very big difference indeed. By the 1950s, scientists had already realized that some scientific measurements and technologies demanded more precise timekeeping than Earth’s rotation could provide. So, in 1967, they officially changed the definition of a second. No longer was it based on the length of a day but on an extremely predictable measurement made of electromagnetic transitions in atoms of cesium. These “atomic clocks” based on cesium are accurate to one second in 1,400,000 years. Most people around the world rely on the time standard based on the cesium atom: Coordinated Universal Time (UTC). Another time standard, called Universal Time 1 (UT1), is based on the rotation of Earth on its axis with respect to the sun. UT1 is officially computed from VLBI measurements, which rely on astronomical reference points and have a typical precision of 5 microseconds, or 5 millionths of a second, or better. “These reference points are very distant astronomical objects called quasars, which are essentially motionless when viewed from Earth because they are located several billion light years away,” says Goddard’s Stephen Merkowitz, the Space Geodesy Project manager. For VLBI observations, several stations around the world observe a selected quasar at the same time, with each station recording the arrival of the signal from the quasar; this is done for a series of quasars during a typical 24-hour session. These measurements are made with such exquisite accuracy that it’s actually possible to determine that the signal does not arrive at every station at exactly the same time. From the miniscule differences in arrival times, scientists can figure out the positions of the stations and Earth’s orientation in space, as well as calculating Earth’s rotation speed relative to the quasar positions. Originally, leap seconds were added to provide a UTC time signal that could be used for navigation at sea. This motivation has become obsolete with the development of GPS (Global Positioning System) and other satellite navigation systems. These days, a leap second is inserted in UTC to keep it within 0.9 seconds of UT1. Proposals have been made to abolish the leap second and let the two time standards drift apart. This is because of the cost of planning for leap seconds and the potential impact of adjusting or turning important systems on and off in synch. No decision will made about that, however, until 2015 at the earliest by the International Telecommunication Union, a specialized agency of the United Nations that addresses issues in information and communication technologies. If the two standards are allowed to go further and further out of synch, they will differ by about 25 minutes in 500 years. In the meantime, leap seconds will continue to be added to the official UTC timekeeping. The 2012 leap second is the 35th leap second to be added and the first since 2008.
i loved this text from you, helped me a lot. i am really grateful. your post is really good and informative. i’m surprised that your post has not gotten any. good quality, genuine comments. you have done a great job by posting this article. thanks!!! great and educative content, thanks for being so important for the education. this is a nice article with a beautiful usage. please, keep those posts coming. i found this topic very interesting if you have more to teach us about this subject please post. this is a really interesting article. thanks.